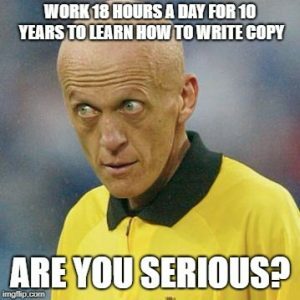 How To Be A Copywriting Ninja By Next Week! 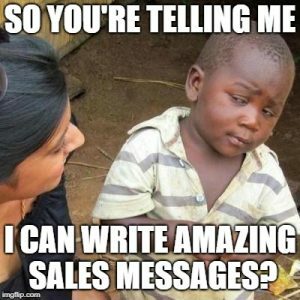 If you’re sincere about wanting to write amazing sales messages, then this copywriting secret holds the keys you need to succeed if you want to avoid having to wok 18 hours a day for 10 years to learn how to write copy. The #1 thing you need to understand is this: you need to first make the decision that you’re going to get good at copywriting. Then you need to commit to getting good at different parts of copywriting in a specific order. 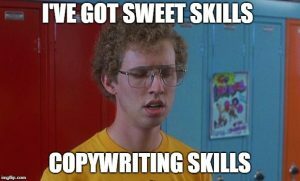 The most important thing to understand with this is that you can become a ninja at copywriting without having to become a master at all facets of copywriting (which isn’t necessary and would take forever anyway). Online business owners need to know this secret because if you try to become a master copywriter you might as well plan on spending the next 20 years not coming out of your basement for anything other than the occasional potty break. First thing you need to do is get really good at headlines. Then you need to get really good at writing bullets. Then you need to get really good at phrasing your offer in such a way that people find it irresistible and a high percentage can’t say no. Finally, you need to get really good at telling stories that illustrate the points you’re trying to make in your sales copy. Option #1: Use Funnel Scripts. This is by far the EASY button for writing high-converting copy since you only have to fill in a few blanks, whack a button and copy and paste the results. Option #2: Study copy that made you spend money. 99 times out of 100 YOU are a member of your target audience. As a member of your target audience, you know what kind of copy works on you and will work on other members. Study the headlines, offers, stories and bullets in those offers that got you to part with your hard-earned cash. Option #3: Study Successful Competitors. Often called “Funnel Hacking” this is the process of dissecting your competitors’ offers, pricing, copy and more (as long as you know it’s actually selling) and then modeling what they’re doing over to your business..
Here’s the truth I know from personal experience. An amazing headline with below-average sales copy will ALWAYS out-perform a below-average headline with amazing copy. Because a great headline gets more people to stop and read your sales message. It’s kinda like a major league hitter: the more times you get up to bat, the more chance you have of getting a hit. I learned this one morning when I changed a headline on a sales letter and INSTANTLY had a 400% increase in sales… just by changing a headline! Get good at headlines FIRST… and the rest will follow. Did this get you excited?